On Friday 8th May Brian Robertson and his band of merry men, Simon Gogolin, Allan Thompson, Chris Holt, Russell Hunter and Jimmy Wells made their way to Nottingham cautiously optimistic of a strong finish to the season. Following the pre-battle photographs, the action commenced against a strong Welsh side. First on was Jimmy making a welcome return after injury. He played the experienced Ian Fenner-Evans and narrowly lost 3-1. Next was an extremely tough assignment for Chris against the super fit Richard Murphy. Chris started quickly taking the first but then was slowly ground down losing the next three. Simon had the unenviable task of playing Jon Evans, current British over55 champ. Evans appeared to want to prove a point for the upcoming British Open and made short work of Simon on the night. 3-0 down so it was left to Russell and Brian to put some respectability to the shoreline. Russell outfought a tough Mark Thomas to win 3-1 and Brian looking in good nick beat the tricky Gary Hailes 3-0. A very tight match which could have gone either way. Next up were the English on Saturday morning. Russell was first up against the incessant lob/drop Mark Hildred and found it hard work losing in three. Brian also found it hard going against the very compact game of John Parkes also going down 3-0. There was no let up with Simon playing the British champion Colin Payne and suffering a similar fate. Allan played Darren Withey, a very agile opponent and still suffering the effects of the previous week lost in three. Chris was last on against lefty Ray Burke and like Friday started very well taking the first. Ray however had other ideas and came back strongly to take the next three hard fought games. An extremely hard task had proved a step too far on this occasion. Last up was the battle against Ireland and what a match it proved to be! Jimmy looking sharp proved far too strong for John Dineen with an easy 3-0 victory. Brian played the deceptive George Hewitt and could never quite get to grips losing 3-0. Simon then only had to beat the current World champion Willie Hosey, who was like a pocket rocket and did to Simon what he did to his other opponents winning comfortably 3-0. Chris produced his best squash of the weekend with a hard fought 3-1 win over Damien O’Reilly. This set the stage for a dramatic and at times breathtaking decider between Thommo and the diminutive Andre Maur. Each game was well contested, Thommo taking a 2-1 lead, Andre preferring to hit outright winners than run around. The match tempo went up a notch in the fourth with some extremely tight rallies and a couple of outrageous decisions culminating in a 10-8 score in favour of the Irish. The decider was a classic once Andre had straightened his hair and set to the task. Both players looked down and out at various stages but none more so than when Thommo found himself match ball down at 8-6. As he has done many times however Thommo dragged himself back from the brink to level at 8 all. Andre calls one, Thommo hits the decisive winner and the crowd are delirious after such a spectacle! The end result was of course a 3-2 well deserved victory for the Merry Men who finished the campaign on a high! On the Friday night, the first match was versus Wales, when a sound 4-1victory was recorded. At strings 1 to 3, Ken Reid, Dave Brown and Vinnie Taylor, all won their matches 3-0, while Mike Gibson had a real battle in his first Over70s International, at 4, eventually winning 9/6 in the fifth. Alfie Thomson at 5, also making his first Over 70s International appearance, won the first game, but appeared to tire in the next three games, losing 1-3 (seems likely that starting his journey to Nottingham at 4.00am that morning, to catch the train in Aberdeen, to get to Nottingham for his 5.30pm match, took its toll!). After a good night’s rest, Alfie got the team off to an excellent start in the second match, versus England on the Saturday morning, with a 3-0 win at 5. Vinnie at two games all, against the English number 3, looked like he might extend the team’s lead, but unfortunately he eventually lost in the fifth. Next on was Ken, who got off to a good start winning the first game, against the England number 1, but eventually lost 1-3 in an evenly contested match. Mike lost 1-3 to a solid performance from the England number 4, and Dave started off well in the first game, versus the very strong England number 2, but lost 0-3. 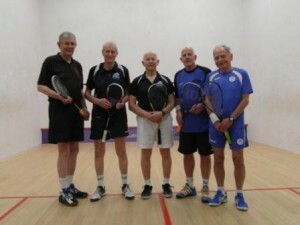 Thus 7 points were earned from this match versus England, which was by far the strongest team at Over 70s, having the present British Open Champion and the reigning World Champion, at that age group, playing at 1 and 2, respectively. However, many more points recorded against England this year than in any other Home Internationals, over the past few years. The third match, versus Ireland on the Saturday afternoon, was to establish who would take second spot in the final placing (since England were unlikely to lose to Wales). Excellent wins, both 3-2, from Vinnie at 3rd string, and Alfie at 5th string, saw Scotland leading 2-0. However, Ken and Mike both lost 0-3, taking the score to 2-2 in matches with one match to play. Dave started well, taking the first game, but the Irish 2nd string proved too strong and eventually won 3-1, giving Ireland the whole match 3-2. 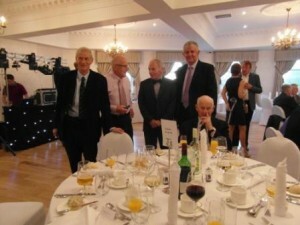 The whole weekend was very efficiently organised, the facilities at Nottingham Squash Club were excellent and everyone enjoyed good food and company at the Dinner on the Saturday night at St James’ Hotel. Thus Scotland came third with 32 points, behind England with 57 points and Ireland with 41 points, while Wales came last with 15 points. It was a real team effort, to be one individual match win short of achieving the 2nd spot, with all players making a significant contribution over the three matches (Vinnie 8 points, Alfie 7 points, Ken, Dave and Mike all 4 points). We have one or two others turning Over 70 for the 2015-16 season, so hopefully there will be strong competition for places in the team to represent Scotland in the 2016 Home Internationals, which are presently scheduled to take place in Glasgow on 13th and 14th May 2016 (so could all concerned please check their calendars and perhaps hold back from booking world cruises over those dates, since it would be good to have a squad of six for the Glasgow matches). We headed to Nottingham to defend our title from last year but unfortunately it was not to be. A combination of Scotland losing our number 1 through injury and a strengthened English team made our task a difficult one. 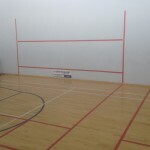 Our first match was against a strong Welsh side on the Friday evening. Jennifer McArtney had a huge battle against Karen Workman at no 5 and had to dig deep to win an exciting 5 setter and secure the first tie. Moira Atkinson was up next at no 3 against the legendary Lynne Davies. Not renowned as a fast starter Moira actually did not let Lynne settle and won 3-0. Pauline Douglas showed why she is a world champion by winning 3-0 against Carolyn Gooding at no1 to win the match. 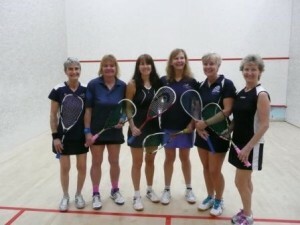 Joyce Leach started slowly against Wendy Norris but recovered to win 3-1 at no 4. Last up at no 2 Sue Strachan played Sian Johnson for the 2nd time in the Home Internationals. After 4 very competitive sets Sian managed to reverse the result from last time and won 3-1. So an excellent 18-6 result. Saturday morning and England were on form. They all played extremely well and although we pushed them in a few sets we were beaten 20-0. What more can I say. They deserved to win the competition and did not drop a single set all weekend. Well done England. But Moira got the most points so deserves a mention. Pressure off as we played Ireland in the afternoon but still needed to win to take second place. Strong 3-0 performances form Christina, Jennifer, Sue and Pauline gave us our victory. Joyce didn’t really get into the match against Dympna Riordan who played very well and lost 3-1. Final result 18-3.